Santa Barbara wine country gained tremendous fame (and a measure of fortune) with the movie Sideways touting the delights of the Pinot Noir grape. 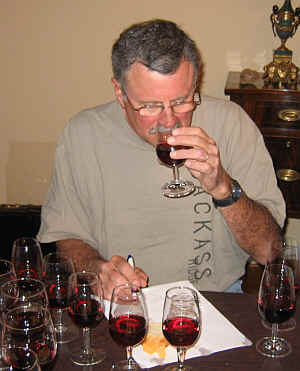 A sub-region and special appellation within Santa Barbara County is the Santa Rita Hills appellation. You'll notice "Santa" is always abbreviated to "Sta." 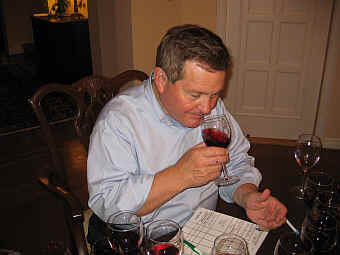 That's because the Chilean winery, Santa Rita, was fearful American usage of the name "Santa Rita" would be detrimental to their sales and so, as of January 2006, it's now "Sta. Rita Hills." The appellation is situated between Lompoc and Buellton with the Purisima Hills to the north and the Santa Rosa Hills to the south. Latest statistics show grape vines to cover approximately 1700 acres. 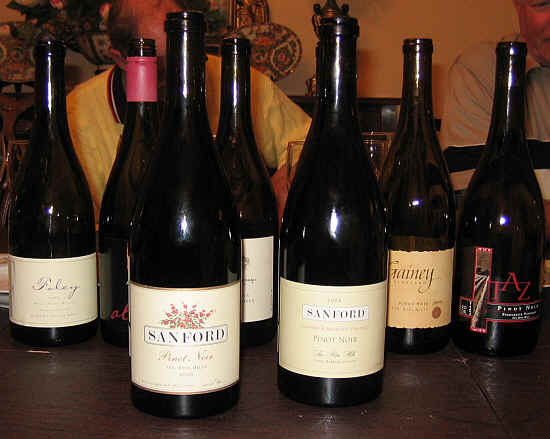 We assembled a set of 8 wines from the Santa Rita Hills appellation, all from the 2006 vintage. 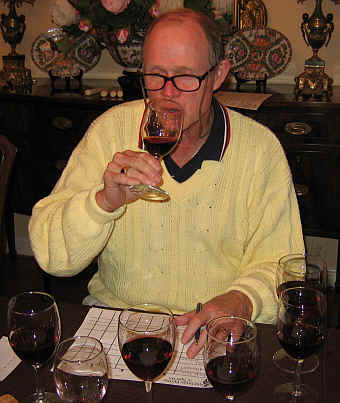 Despite the arrival of dozens of new labels on the Santa Barbara wine scene, I found "nice" wines, but didn't think the Domaine de la Roman�e-Conti should worry about the competition. These are perfectly "polite" Pinot Noirs with the correct color intensity and identifiable varietal fragrances. That said, none of the wines was overwhelming complex or a show-stopper. I'm sure most would show well with a nice meal and be satisfying if they cost $25-$35 a bottle. Showing clarity and a garnet color, this wine offers a lightly brushy, forest-floor note on the nose with a lightly floral tone. It's a medium-light bodied Pinot Noir which struck me as being about the same level of complexity as a good cru Beaujolais. I wouldn't pay $30 for this caliber of Pinot Noir, but it's a perfectly pleasant glass of wine. I gave it no stars on my three star scale, equating this to a standard quality wine. MacMurray Ranch, by the way, is a label owned by the Gallo family. Clear in appearance, Gainey's wine displays a light garnet color. It's got a mildly herbal aspect to its fragrance, with a perfumy note reminiscent of baby powder. 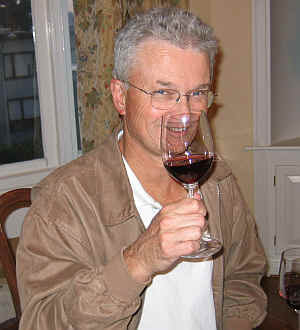 The wine is dry and medium-bodied. I found it to have a rather lush texture on the palate, with good Pinot Noir character and a lengthy finish. Best in its youth. One star. Medium garnet color and clear in appearance, there's a low intensity Pinot fragrance and a woodsy element reminding me a bit of pencil shavings. Medium-light in body, there's a hint of an earthy note on the palate and light cherry/berry fruit. I'd give it a half-star rating and find it to have limited aging potential. This label is the work of Santa Barbara wine pioneer Richard Sanford, who "lost" his winery to his marketing company and shareholder. While I am sympathetic to Sanford and the sad way things ended up, I must say this, to me, was a major disappointment. Clear in appearance, it's medium garnet in color. 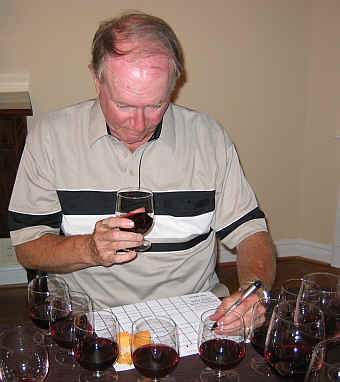 There's a hint of cherry-like fruit with an underlying 'sour' character on the nose. It almost has a hint of briny, cabbage-like notes on the nose. I didn't find the wine to be dry, either. There's a 'sweet' element on the palate that may be a hint of sugar or it's 'flat'. On the palate there's a smoky, hickory, smoked meat, bacon-like character. Charry elements come through, too, Cocoa and milk chocolate sort of flavors arrive at the end, perhaps due to a touch of sweetness? It's a real mixed bag of flavors and I didn't especially care for its lack of focus and odd features. Your mileage may vary, but I'm giving this no stars. Clear in appearance, this has a medium-light garnet color. There's a cherry and kirsch brandy sort of tone to the fragrance and I found a faintly woodsy note underneath. It's dry and medium-bodied. The tannins come to the fore on the palate with a simple and pleasant intensity of Pinot Noir. Some might question the balance and if it needs quite all that tannin, but I suspect on the dinner table, this will show nicely. I gave it three-quarters of a star as it's pleasant, but not profound. Here's a wine that, given its pedigree, should be grand and it came close to meeting expectations. The nose displays classic Pinot Noir fragrances with cherry-like fruit and a touch of vanilla. It's dry on the palate and medium+ bodied. Good fruit in terms of flavors and nice touches of vanilla, too. I wrote "nice little Pinot Noir," but now seeing it's from what many would view as a "grand cru" site, perhaps the wine should have offered more. I found several years of cellaring potential, so perhaps it will blossom and gain a layer of complexity? At this stage I'd give it a one star to one-and-a-half star rating. Worth watching. The entry-level Pinot from Sanford won the tasting and this is a nice wine! Clear in appearance, it has a nice garnet color. The aromas display "Pinot Noir" fragrances with hints of cherries and light oak. It's dry and medium-bodied on the palate. I found a touch of heat on the palate and light tannins. It's a nice wine and quite correct...for my taste, it's less compelling than the Sanford & Benedict bottling. 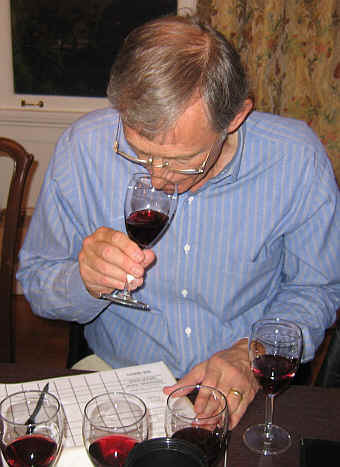 Eight of the 11 tasters had the two Sanford wines ranked within one or two positions, but one taster pegged this first and the S&B 6th, swinging the results to this bottling. I gave it a half star to one star rating, by the way.